Light, color and space dissolve completely. 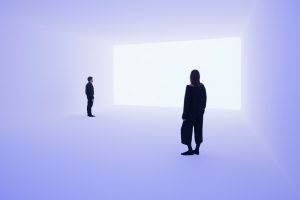 In the light installations of James Turrell (* 1943, Los Angeles / USA) you lose all sense of space after a while. Neither the dimensions nor the source of the light can be perceived. The eye no longer finds any points of orientation, and the gaze loses itself in the infinite vastness and depth of a dense colored-light mist that envelops you completely. Sometimes the gentle color changes are interrupted by flashes of light. “Those who immerse themselves in James Turrell’s light spaces, have a magical experience: the colored, changing light makes the space seem endless,” writes the curator of the exhibition in Baden-Baden Judith Irrgang (in ArtLight 2018’Mai, p.10). 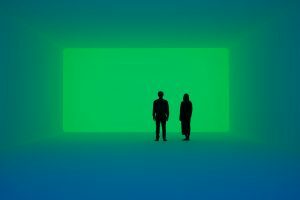 Turrell was enthusiastic about flying as a young man, he says about his light spaces: “It’s like flying into the clouds as a pilot or suddenly not knowing where the top and bottom are when diving. I’m interested in the landscape without a horizon, because humanity is increasingly moving into such a landscape. I am an architect of the visual space and let them experience this landscape. … I do not create the light that we normally see with our eyes open, but the colors we know from our dreams. The space of the dream interests me, its rules are different. I want to show that. “(In ZEIT ONLINE: Interview with Tobias Timm, July 6, 2018) Turrell gives the immaterial light almost a physical presence. During a flight in the 1970s Turrell saw the extinct volcano, Roden Crater ‘in the Arizona desert. He bought it and since then has been converting it into a kind of sky observatory. The system of underground halls, shafts and galleries is like a temple dedicated to the light alone.